John was born in London on August 27th, 1923 and began fishing as a small boy, first on the river Wandle with a net and a jam jar and then moving on to a rod at his grandfather's house on the Thames. John left school to be an apprentice engineer, but the war soon put a stop to this career and he joined the East Surreys, training as a parachutist before being demobbed in 1947. He then joined the family business, F. Goddard & Co. Ltd, who made garden furniture. It was in 1950 that John designed a fishing seat and began trading under the now internationally recognised name of Efgeeco. John developed many hugely successful ranges of tackle during the years Efgeeco traded, before selling the company in 1984. 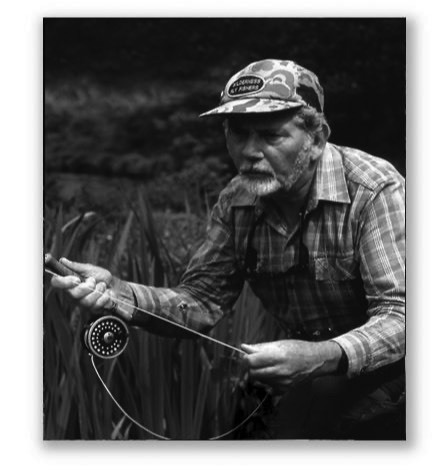 John had been an enthusiastic and skilled fly fisherman since the early 1950s, and his expertise took him on fishing trips all over the world, from Norway and Newfoundland to New Zealand, Mexico, South Africa and Kenya to name but a few. John was also an experienced big game and sea fisher, and represented England at international level big-game fishing competitions. In the 1960s he travelled widely, undertaking surveys of big game and promoting the fishing opportunities of many exotic locations at the same time. His autobiography, The Passionate Angler, published by Medlar in 2008, covers many of these expeditions. In 1967 John published Trout Fly Recognition, the result of his meticulous study of natural flies, and much painstaking photography. John's interest in fly-tying led to him being recognised as an expert entomologist, and over the years he developed more than fifty original fly patterns, the most famous being the G&H Sedge (or Goddard Caddis), developed with his friend Cliff Henry. John contributed to many fishing journals and had ten fishing books published. He was a former President of the Fly Dressers' Guild. John Goddard died on the 26th of December, 2012, aged eighty-nine.